Good Morning! 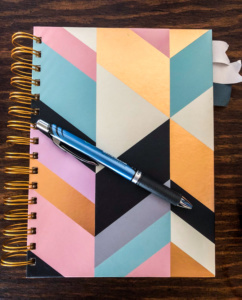 I wanted to share with you some of my go-to things I use on a daily basis that make me feel ready to tackle my day and feel happy and prepared for what’s ahead. 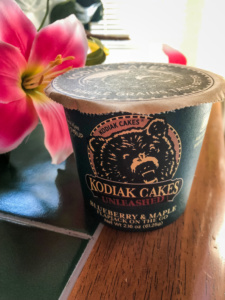 Kodiak Cakes!!! I literally eat these 6 times a week for breakfast. I am also that girl at Target who buys up the whole shelf because I HAVE TO HAVE MY KODIAKS!! This is basically a pancake in a cup. You can add milk, almond milk or water ( I use water) and heat it up in the microwave for a quick morning bite! I like to throw in a handful of fresh blueberries in mine for some extra antioxidants and yummy-ness. These little cups of flapjacks are 250 calories and use 100% whole grain and contain 6 grams of protein and 5 grams of fiber. Starbucks Brand Mocha iced coffee. 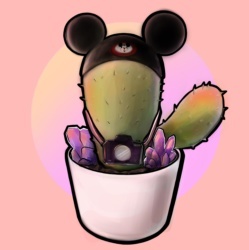 I drink this daily, usually in one of my many Disneyland mugs over ice. I don’t like hot coffee and I don’t like leaving my house for coffee so I discovered this at Target and fell in love. It is pretty sweet so if you don’t like sweet stuff I’d try something else, but if you enjoy sweet iced coffees this is one to check out. I drink maybe 4 oz of it daily only because I prefer a ton of ice. It’s also my only source of caffeine 90% of the time because I don’t drink soda unless we go out to dinner or something. 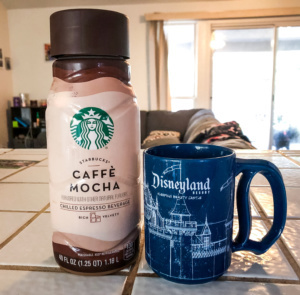 They sell these drinks at Target and Savemart and have multiple flavors (mocha, caramel, and seasonally pumpkin spice or peppermint mocha). Daily Vitamins!!! 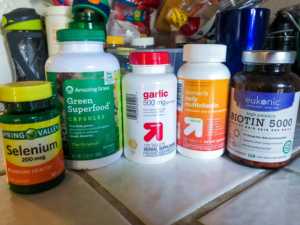 I love my vitamins an I think it’s important for everyone to get them. I take biotin for my hair, nails and skin. I have hair down to my waist and I love that is is still thick and healthy despite the fact that I have started coloring it. My colorist always tells me how healthy it is. I use Garlic for my heart health and immunity. I am not always the healthiest person and women need to be proactive about their heart health on a regular basis, especially when you have major issues with insomnia like me. Insomnia has been noted in nearly 45% in cardiac patients in the US, so get some sleep and take care of your heart! I also take green superfood capsules which help in the veggie department….I hate eating vegetables and I am constantly failing at adding them to my diet so I take these to make sure I get some green in me! I have even thrown them in my fruit smoothies with a handful of spinach. I take selenium for its antioxidant properties, heart health benefits and and for my thyroid health. Last but not least I take Women’s multi-vitamin when I’m going on trips and can’t pack my plethora of vitamins I typically take. These encompass most of the daily vitamins you should probably be taking normally, I got this bottle for $3 at Target. I am a mess without a To-Do list. I always have about 5 or 6 notebooks on hand to make lists or scribble notes in daily. 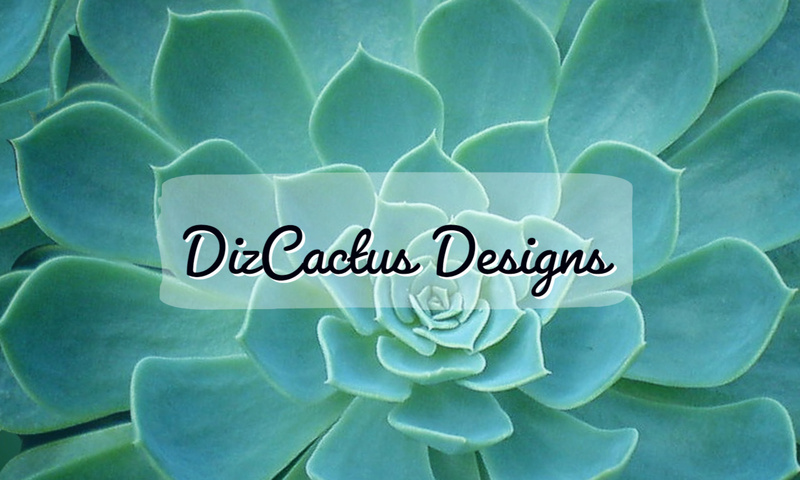 I have daily chores, projects, shopping lists, calendars and budgets all in my notebooks. My family says I am obsessed with lists and I have to agree with them, but they work for me. I have a million thoughts and ideas running through my mind every day and I can’t always keep rack of it all so I I rely on my ability to write it all down. A woman with a plan is equal parts smart and dangerous. 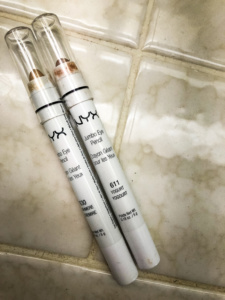 Nyx Jumbo Eye shadow Crayons in cashmere and yogurt shades. I have zero knowledge of what I am doing when it comes to applying makeup. I typically wash my face, lightly brush powder on my face, smear some of this amazing eye shadow on my eyelids and add some mascara and hope for the best. These are about $3 each and make me feel pretty. They’re very lightweight and simple and for someone who isn’t into wearing a lot of makeup I’d say they’re just right for me. SPOTIFY IS LIFE. I can’t go a day, or even an hour without listening to music. This is my favorite app on my phone and laptop and my entire family has an account, even Ben (he made a playlist called Homework Jams and it is amazing). I have used Spotify since it came out years ago and have cultivated so many crazy playlists with it that match my moods. I use every single feature I can on the app and pay for a family plan subscription monthly. I have added my “Positive Mondays” Playlist for you guys to check out and help get your week going. So this is what gets me through my busy days. What kinds of things help you get through the week? Do you keep it traditional and stick to the same go-to’s or do you switch it up to keep things exciting? Whatever you do, I hope you have an amazing week and get things done!